That's right!!! Ma only gots ONE CARD!!! BOL!!! BOL, how can the peeps stand having their hinnie kick every year! Who's the stinker that spoiled your shutout? Our mama only has 3 so she is not doing much better than yours! BOL!! PeeEss...Our parents only gots 1 card too!! It looks like someone is having FUN! Yes Ruby so far you are the winner!! I love getting Christmas cards!!!!! 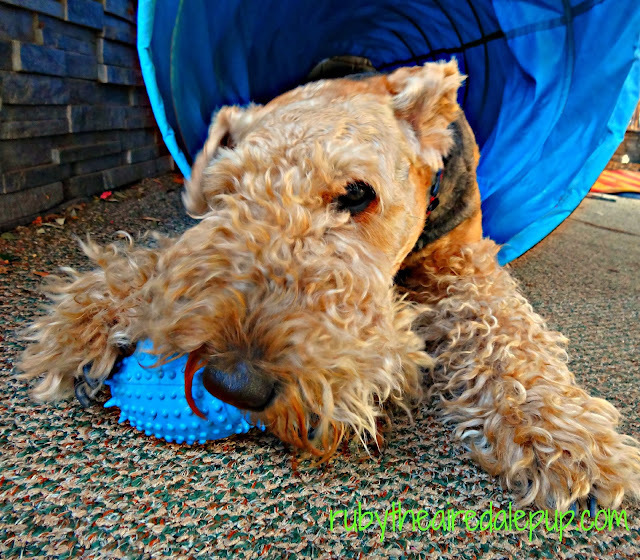 Playing with your blue ball in your blue tunnel. Looks like lots of fun! Did you get a new toy, Ruby? Such a pretty color - matches your tunnel. We don't have a card count, but we are WAAAAAAAAAAAY ahead of the peeps too. 40 !!!!! OMD… dat is pawsome. Isn't this just a blast! This is the best time of the year--we run rings around our peeps! Poor poor Ma, there is no catching up now. Your poor mom, Ruby! We hope she isn't feeling too left out! mol mol mol RUBY I personally think it is kind of funny our count compared to the peeps. Mom's excuse is she spent all her time addressing my cards to my friends. I think she just doesn't have any friends. Haha rubes your peeps will never catch up! Hi there Ruby! Looks like you have a fun toy there! Oh my....they should save theirselves the embarrassment and throw in the towel! WHAT? You mean people are supposed to get cards? PS. Did you know that Ruby is one of the most common female dog names of 2013? I got more than the chi's this year!